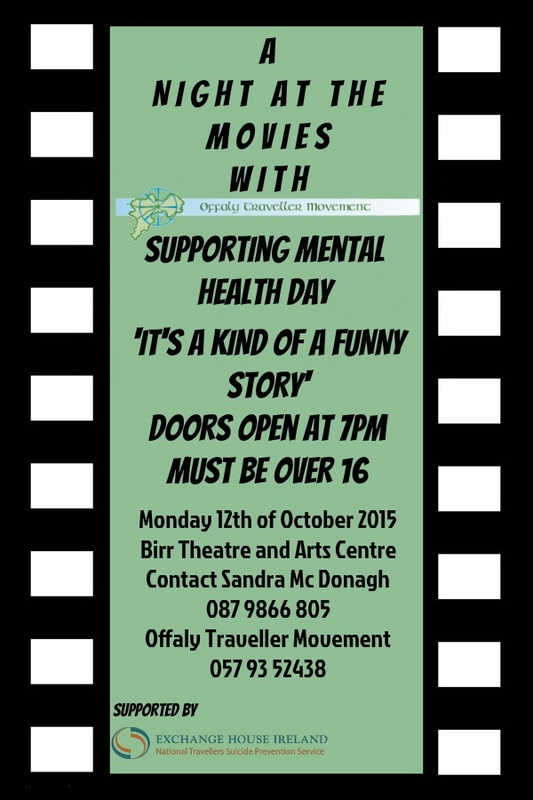 Offaly Traveller Movement (OTM) and Exchange House Ireland National Traveller Suicide Prevention Service are hosting a movie night on Monday 12th of October to mark Mental Health Day. The movie will be shown in Birr Theatre and Arts Centre and doors will open at 7pm. The event will be open by Sandra Mc Donagh, Mental Health Social Worker, Travelling to Wellbeing, OTM and Patricia Mc Keever, National Traveller Suicide Prevention Trainer. There will be a guest speaker on the night giving a talk on his personal mental health journey. All welcome. Please contact Sandra at 087 986 6805.